Suppose I have a bull call spread where I am long on an ATM Call (+ 0.509 delta) and short OTM call (- 0.220 delta). What will be my probability of success in this trade? Your otherwise interesting question is one that may not have enough detail. I just pulled up the probability graph for a trade I entered into a few months ago. You can see that it required a current price, prices for both strikes, as well as the stock volatility, interest rate, and days until expiration. In my case, 'success' wasn't quite yes/no, as there's the range where the price is within the spread prices and while profitable above the spread cost, it won't provide the maximum trade return. As Joe Taxpayer stated, there isn't enough information to answer this question. In nearly 40 years of using options, I have never had the slightest interest in what the probability of a trade is because my decisions have always been made from price and indirectly, implied volatility. So while I can contribute some info, I have no definitive answer for you. Some use delta as a proxy for the probability that an option will expire in the money. Your OTM short call has a delta of 0.220 so the probability of your spread achieving maximum profit would be 22%. Take this proxy with a grain of salt because delta varies as implied volatility changes. I'd bet that the results from it would be reasonably close to the delta estimate. 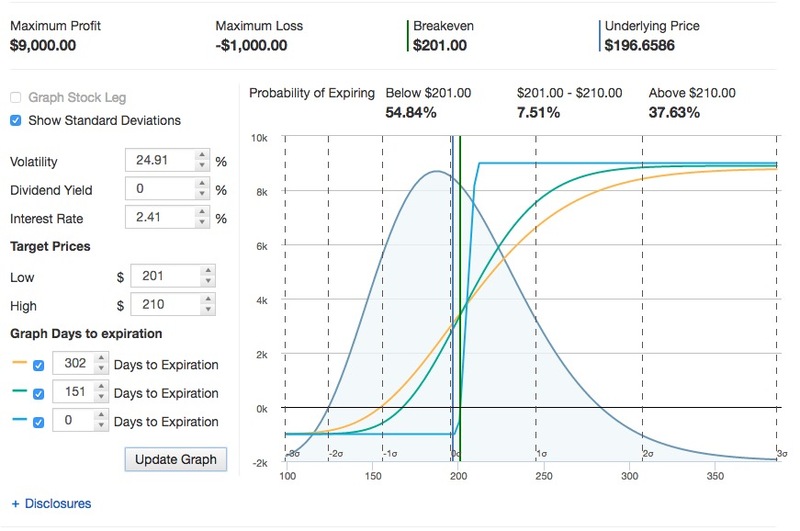 Does option delta predict expiration probability?